I’m intrigued with the popularity of vampires and zombies these days. Just doing a simple search for vampires on Amazon.com provides over 51,000 book titles. A search on zombies provides another 24,000. Netflix offers many titles under each category as well. After more than twenty years on consulting, I’ve observed how consultants and clients interact with each other. They each have their own way of looking at the other. I’ve come to the conclusion that clients perceive consultants as vampires and consultants perceive clients as zombies. Vampires are Blood suckers: We all know that a vampire needs to survive on the blood of others. Consultants are always trying to upsell. They want to add scope to the project and then sell that next project in addition. Billable hours and sales, at the expense of the client, are their lifeblood. Vampires are aristocratic: Just as vampires have the attitude of coming from the upper echelon, so do consultants. They dress more superior and have the condescending attitude that they’re just better. Vampires are nocturnal: Just as vampires only come out at night, consultants like to burn the midnight oil. Then, they come in later in the morning because of their late nighter. When the client comes in at 8:00 AM to ask a question, the consultants are nowhere to be found. Vampires can appear as mist: Consultants do the analysis, develop the plan, and present it all into a nice PowerPoint presentation. Then they disappear as soon as the actual execution of the plan is to be performed. 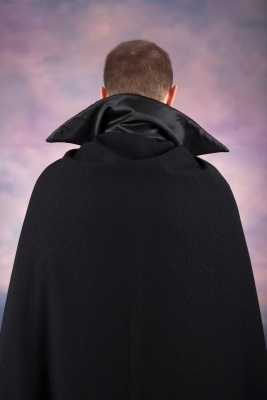 A vampire has hypnotic power over his victims: Many a client employee whose boss has hired a consultant has probably wondered what caused them to hire that consultant. He must have been under the consultant’s hypnotic power. A vampire can turn victims into vampires: Every once in a while, a consultant convinces a client employee to come over to “the dark side” of consulting. Many consulting contracts prohibit pilfering employees from either party, but it still happens. Before long, the new consultant is taking his former colleagues out to lunch trying to drum up new business. A zombie is someone who has lost his or her sense of self: When a consultant first meets the client employee, he often finds someone who is entrenched in the politics and apathy of the organization. He’s there to put in his time and leave at 5:00. You consultants want to change how we do things? Why? Zombies have increased endurance relative to normal humans: clients can endure long meetings in which their presence neither adds value nor is required. They go because they were invited. What else are they going to do? Zombies have reduced or absent cognitive function: Clients know only their area of the business. If you want to know how another area of the business works, go talk to someone in that area. It’s not my job. 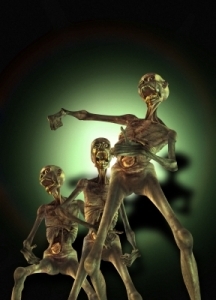 Zombies are Slow: Clients have no sense of urgency to implement change. They’re happy with the status quo. They show up late for meetings, or not at all. They practice passive resistance to hold up any chance of real change taking place. Zombies are not dead, yet not alive: Client employees are present, yet they aren’t. They show up for work every day. They attend their meetings. But they are rarely productive. Obviously, these are extreme perspectives that consultants and clients have of each other. Hopefully consultants aren’t that condescending toward their clients. Hopefully clients aren’t that cynical toward consultants. But, these attitudes sometimes exist on both sides. Consultants can provide a valuable service to their clients if they face it with the right attitude. Clients can sometimes be resistant to new changes the consultant is trying to help implement. Maybe the client employees haven’t been convinced that the new changes are better than the existing ways of doing business. It is the consultant’s responsibility to convince them why the changes are better. Consultants and client employees are often incented and motivated by different things. If the client employee wants to stay with the status quo and has no incentive to change, the consultant should work with the client to find ways they would like the changes. Will it make their job easier? Will it allow them to make decisions that will help them move up the corporate ladder? Consulting, more than anything else is a communication process. Communicating change to a client involves communicating why the client should be interested in the first place. It is about the client. How have you broken down stereotypes to convince a client to change?